This Chandra X-ray image shows the relationship between the black hole Sagittarius A* and the supernova remnant Sagittarius A East, both of which are located in the center of our galaxy in the constellation Sagittarius. For the first time, astronomers using Chandra were able to separate the supernova remnant, Sgr A East, from other complex structures in the center of the Milky Way. The emission from the supernova remnant Sgr A East is depicted by the bright yellow and orange tones in the middle of this image. From the Chandra image, scientists can clearly see that Sgr A East surrounds Sgr A*, the Milky Way's central black hole found near the white dots in the lower-right portion of the central object. 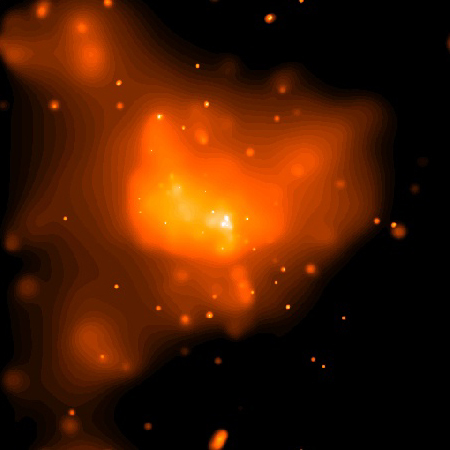 With Chandra, astronomers found hot gas concentrated within the larger radio shell of Sgr A East. The gas is highly enriched by heavy elements, with four times more calcium and iron than the Sun, and that confirms earlier suspicions that Sgr A East is most likely a remnant of a supernova explosion. While dozens of supernova remnants are known in our galaxy, the proximity of Sgr A East to the black hole in the center of our galaxy makes it important. 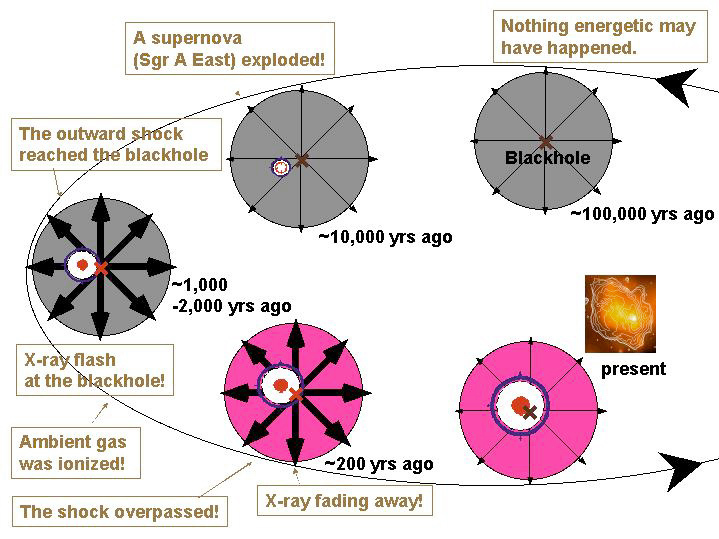 By detailing the association between Sgr A East and Sgr A*, astronomers hope to learn if this is an example of a common relationship between supernovas and black holes throughout the universe. Credit NASA/Penn State/G.Garmire et al. Coordinates (J2000) RA 17h 45m 40.00s | Dec -29° 00´ 20.00"